I test-ran around the block earlier Saturday morning in my race wardrobe to see if it felt okay, and it worked: My Carhartt 2-in-1 cap over a balaclava, race-mitts over a pair of gloves, two sweatshirts over a t-shirt (with the bib pinned to the top sweatshirt, meaning it wasn’t coming off), two layers of compression running pants, and two layers of socks in my Topo Athletic black ST2‘s. My head and torso felt warm. My feet felt cold, and to a lesser extent my hands and legs. F3 had the path plowed and salted so I knew I didn’t need heavier shoes with their trail-tread. Plus from experience my thicker running shoes did nothing more to insulate the cold, so that wasn’t a concern. I wanted race-light shoes and the ST2’s are the shoes I plan to race in for 2019, so I wore those. I had to haul-run en route to pre-race coffee and went through Hof Breathing to warm up a bit. After half an hour of coffee and warming up at Emerald City Coffee under the Sheridan CTA station, I caught the next Red Line south to South Loop, where I haul-ran along the paths to Soldier Field. After stowing my coat and checking my bag, I walked outside to piss-steam the pipes of a port-a-john and then found a spot indoors to Hof-Breathe some more before we herded outside to start. As much as I wanted to go out with a group my speed (around 9:00-9:15/mi), they started the race in waves and that would have meant an extra 3 minutes standing in the ice-cold, so I went out with the back of the 2nd wave and rode a bit fast with them through the tight early turns before hitting the ill-planned bottleneck at mile 1 near what would be the finish line. From there, I drifted back and settled into a useful pace for the race. Because of herding with a faster group I knew I inherently went out a bit too fast, and sure enough we cleared the 1st mile in about 8:45. Sure enough, once clear I had to dial well back to about 9:30-9:45/mi pace to stay level. Around mile 4 (37:00 in) I picked it back up and found something closer to race pace. I hit the mile markers in even 9 minute increments (Mi5 at 46:00, Mi6 at 54:00), meaning I was steadily trimming my earlier deficit. Plus I had warmed up enough to shed both my caps and my gloves (yes, my feet had definitely warmed back up). However, because of the earlier extra effort plus the heat from my layers (with no place to store the caps I did have to wear them around my neck and arms at points), I knew in the back of my mind the other shoe could drop and slow me later in the race. I decided to play foolish optimist and stick with the 9:00 pace to see how it would go. The first shoe met me around the hillier mile 7, where the trail for whatever reason was not as well plowed as the rest of the route, leaving the path covered in slushy snow and other icy residue. 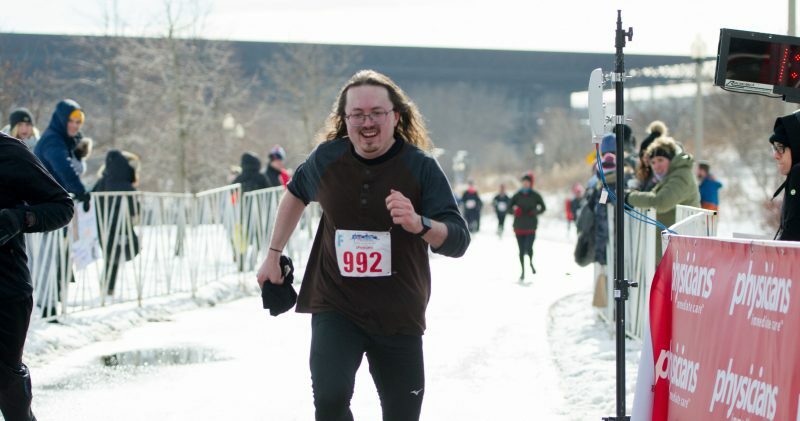 You needed extra effort to maintain anything close to your pace, and not knowing how far the slush obstacle covered the course… I kept trying to stay close to pace, slowing to around 9:20ish, with the notion it would clear in short order. Unfortunately, the icy conditions persisted for at least half a mile, and though it cleared before the turnaround, we still had to go back through it on the way back. I definitely slowed substantially before we reached the turn, and also noticed that a nearby runner had not passed me or fallen back. I decided to do something I don’t do much, and latch onto this runner as a pacer, which I maintained (from a bit of distance back) all the way through the turn, back through the slush and then a bit beyond. This helped immensely, and my mile-over-mile pace improved back into the 9:10-9:15 range. Eventually, she slowed. Remaining steady, I gradually passed and left her behind. Though most of the world had passed me in the early miles, it was mile 8 and beyond where I gradually passed many of these same runners, holding steady even as the after-effects of the extra early effort took hold and I began to tire back to a 9:30 pace. At mile 9 I picked it back up to about 9:15-9:20, as my depleted brain did some bad math and made me think I only had 5K to go… forgetting for a few minutes about that extra mile beyond the 12 mile mark. Eventually I realized my math error, and this combined with fatigue led me to slow down yet again, to around 9:30-9:35. Contributing to this: For a while, as I trimmed at the early-mid miles, I had a bit of delusion that I might be able to PR anyway despite it all. But as I corrected my math I also did math on my pace with what I had left, and realized that PR definitely would not happen. Confirming this was the CES 2:00-pace group coasting gradually by me. I momentarily kept up with them, then realized their pace was too strong for me to suitably hold for the last 3ish miles. I let them go by, decided to stick to what I could do, and focus on finishing with a good kick. I saw an acquianted running colleague had slowed to a walk at mile 11, and after I noted in passing he was almost there and had only 2 miles to go, he picked it back up and surged off. I don’t know how, but this also had a ripple effect on my energy and I somehow found the energy to pick up my pace as well. I still just ran in the 9:15-9:20 range, but was decidedly stronger than what I had done in miles 9-11. The great thing about a half’s distance is that unlike other distances… once you finish the final full mile, the finish line is within sight and easy reach from that final mile marker. The 176 meters is less than half a trip around a track, and sure enough F3’s Mile 13 marker leaves the finish in easy sight. Passing the final marker, I surged to more of a hard rep speed and booked it, surging past finishing runners even as my calves began to cramp yards from the finish, and stumbled through the line at 2:02:37… a hair above 2 minutes over my PR, but also my 2nd best Half time to date. I grabbed any food and drink shoved at me and took the lengthy walk back to Soldier Field. The cramping was a bit evident in my legs but nothing bad… until I got inside and took the first steps up to the Concourse, where my calves seized so painfully I had to fall to the steps, extend my legs and try to get them back. I sat at the far end of the steps for such a while that a couple people asked if I needed medical help, but it was just bad cramping. Nothing other than fluids and a bit of time would help. After probably 10 minutes or so, I was able to get up and walk up the stairs to get my bag. My left calf remained somewhat sore from the experience, and what would have otherwise been a cooldown run back to the train became a slow careful hobble that felt as long as the race itself. Jack Daniels recommends one easy day afterward for every 3000 meters you race, and though I’ll be fine I may definitely need the full week to get back up to speed. Hydration wasn’t an issue: I took water and energy fluid at each of the aid stations, and other than the stations seeming a bit too far apart during my slow later portion I didn’t feel in any way dehydrated. I know what bonking feels like and I certainly didn’t bonk, though my body may have slowed because it sensed I was running a bit low on glycogen. I think I gave that Half just about everything I reasonably could, and given that plus my 2nd best time to date despite the conditions I consider this race Mission Accomplished. My calves cramped as they did probably due to completely depleting all of their glycogen stores. I’d normally be concerned about my calves feeling more worked than the rest of my lower body (which to my credit is certainly sore like I ran a race). But keep in mind that the slippery conditions, both in the race and outside the race (I did have to commute there and back! ), means your calves had to do a lot of work to keep your lower body balanced and in control… whether you’re just walking, or running a race. They didn’t just have to do the work to run a 13.1 mile race… they also had to do extra proprioceptive work to keep me moving and balanced. Add in the extra effort not just to warm up (haul-running with my backpack, no less), but to get through the early part of the race, and it’s little wonder my calves were totally tapped. From the knees up, I felt sore but like I could go for a recovery run. However, my left calf (while functioning better today) needs a bit more rest. That the right calf doesn’t feel as bad indicates some sort of balance and form issue I’ll need to address in training. I like the placement of F3 on the schedule in general, and (other than the avoidably-dumb mile 1 bottleneck, and perhaps the avoidably slushy conditions on the south end of the course) it’s a well-run race. But given the conditions I’m tempted to think twice about doing it next year. Of course, it’s hard to tell what my plans will be for 2020 so who knows if the race would even fit. Still, trying to run well in these conditions was a bit much to ask. Terrible Arctic cold is forecast to hit Chicago this week, and the timing may work for me because my body could certainly use a few days off after that race. It hurts my feelings to even considering running in such cold temperatures.